Zainab Abbas along with Waseem Akram, Waqar Younis, and Rameez Raja is celebrating the birthday of Waseem Akram even in Roza. People criticized all the cricket icons as they were not fasting and celebrating the birthday in Roza. Zainab Abbas is a new cricket sensation since she appeared in PSL. And the legendary cricketer Waseem Akram does not require any introduction due to his outstanding performance. On the eve of the birthday party of Waseem Akram, Zainab Abbas shared the pictures of the celebration. She shared picture other along with Waseem Akram, Ramiz Raja, and Waqar Younis. Celebrating the birthday along with colleagues is not bad at all. But celebration in Roza is really something bad. It’s indeed their personal matter whether they fast or not. But they should respect the holy Ramzan just as other people are fasting. Due to such negligence, people criticized them all, especially to Zainab Abbas. Zainab Abbas shared the pictures of birthday on Social Media Site. People got angry by their actions as no one is expecting such things from such legends. The mix reaction of the people shows that some are ready to avoid this negligence. While other die heart fans of celebrities pass harsh words in social media tweet. One decent reply of this person shows that he has no concern with their Roza but the thing is they don’t even respect Ramzan. 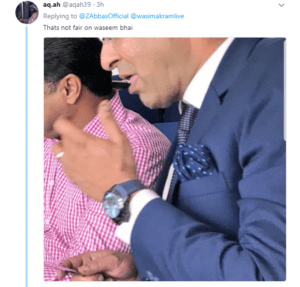 Another die heart Fan of Waseem Akram replied by posting a picture. He said that he is not expecting such thing from this legend. Off course, all of us never expected such things from him. The angriest reply was from this person. He criticized Zainab Abbas specifically. He even suggests her to change her Islamic name and use another name for her because she doesn’t respect Ramzan. When there was a bundle of heat and advice messages. Some people only look on the positive side and wish birthday to Waseem. The most interesting yet funny reply was from a guy. He shared a picture of a man who is taking pictures of Zainab. While other people were busy in celebration of the birthday. In short, the sharing of such stuff during Roza becomes a great trouble for all celebrities. Especially for Zainab who shares the post. Honestly, they should respect the Ramzan even they all were not fasting. It’s better to delete the pictures right now and stop the hate which is spreading rapidly.